High school students may apply to become Teacher Assistants or Chaperone Assistants who help in the Elementary and Intermediate Camps. Preference is given to students who are at least sixteen years old and receive high recommendations from school or private teachers. Assistants are not paid; however, this incredible opportunity is a great way to gain valuable experience while getting even more fun time at camp. 1. Sleep in cabins with an another chaperone and ten young campers. 2. Welcome your cabin's campers and guide them around camp. 3. Supervise the safety and participation of campers during all non-musical recreation times. 4. Accompany cabin campers at mealtimes and in table setup and cleanup responsibilities. 5. Prepare your campers for cabin competitions, such as skit night and relays. 6. Provide emotional encouragement and support to young campers who may be insecure in the camp environment. 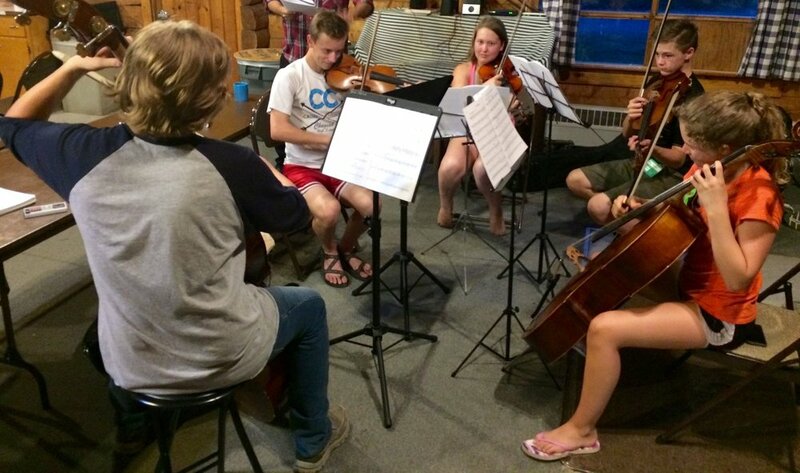 Teacher Assistants are generally students who are interested in becoming string teachers in the future. The program seeks to provide learning opportunities while the assistants are actively involved in helping experienced professional teachers. 1. Sleep at camp during Elementary and Intermediate Camps. 2. Help with setting up, tuning, and playing with students in all orchestra rehearsals as requested by the Music Director. 3. Assist small group teachers as "gofers" and participants. 4. Meet with the Program Director and the Music Director daily to reflect. There are a limited number of openings for Assistant positions. Those selected will be contacted by our Program Director for confirmation. By confirming, Assistants commit to stay at Alaska String Camps' Elementary and Intermediate Camps, July 12-18, 2018. There will also be at least one pre-camp meeting that Assistants will be expected to attend. Chaperone assistants are not required to play an orchestra instrument, however, a musical background is preferred. In addition to the online application, two recommendations need to be filled out by adult non-relatives and sent in. Teaching assistants must specify their primary orchestra instrument. Two recommendations are required, at least one must be from an orchestra or private teacher, the other can be from a teacher, or other adult non-relative, etc.